SATB choirs are always looking for top quality show stopping concert pieces guaranteed to bring the house down with shouts of 'Encore!' 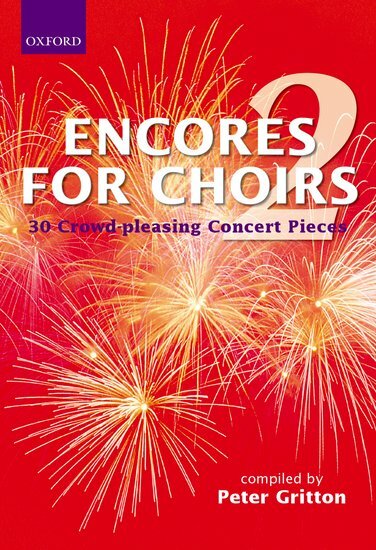 'Encores for Choirs 2,' which follows in the wake of the hugely successfully 'Encores for Choirs 1," boasts a bumper selection of 30 fabulous pieces, ranging in style from the classic and sentimental to the humorous and madcap-something to suit every mood and occasion. Jostling with must-have standards of the repertoire are new pieces and fresh arrangements by some of the finest musicians in the business, including the editor Peter Gritton, John Rutter, Bob Chilcott to name but a few. Together, the volume provides an unrivalled kaleidoscope of concert choices for the accompanied or a cappella choir and 30 irresistible reasons to bring that audience to its feet.